When selecting the conservatory glass & glazing for a conservatory, glass is usually a much better option than cheap polycarbonate alternatives that can become opaque and marked over time. Glass is strong and long lasting, allowing a clear view of your garden and the views beyond, as well as plenty of daylight into the interior of the conservatory. Conservatory Glass is covered by Building Regulations Part N, and your conservatory designer or builder should be familiar with these and how to choose the correct glass for different places in the conservatory. To be energy efficient and keep your heating bills low, you will need to choose glazing with the best glass u-values in combination with other types of glass described here. Heat reflective glass also known as Energy Efficient Glass, will reduce the amount of heat loss from the conservatory and glare from the sun. Laminated glass unlike toughened glass will, when hit with force crack rather than smash into tiny pieces. Toughened safety glass is especially effective if it is double–glazed, while self–cleaning glass will allow the conservatory glass to stay cleaner for a longer period than untreated glass. For traditional conservatories attached to period properties, you may need to choose curved glass, leaded glass or Georgian bars, while frosted glass is useful in a conservatory where privacy is an issue. Glass U–Values are a measure of the rate of heat loss through different types of glass. You should choose the lowest U–Value as possible as this will allow less heat will escape from your conservatory, reducing your heating bills and making you energy efficient. U–Values are calculated as a measurement of the amount of heat lost in KiloWatts, through one square metre of glass per hour. There will be a point at which the investment in better rated glass may not be cost-effective, this will depend on the total area of glass, your current and predicted energy costs, as well as how much time you plan to spend in your conservatory when the weather is colder. If you are planning a north-facing conservatory that receives less direct sunlight than conservatories positioned elsewhere, selecting the best U-value glass will be very important. A glazing or conservatory consultant should be able to help you with these calculations. Heat reflective glass is also known as Energy Efficient Glass, or low-e glass (Low Emissivity). It has a special metallic coating on one side giving a slight brown or grey tint to it. The coating allows the suns energy to pass through from the outside while reducing heat loss from inside the conservatory. Heat reflective glass by itself will not improve insulation; it has to be used in combination with double or triple-glazed units. There are two types of heat reflective glass. Pyrolytic or hard-coat glass does not have to be sealed into double–glazed units but it is less effective than sputtered or soft-coat glass. Sputtered glass has a coating that is easily damaged by air or moisture, so it can only used on the inside of sealed double–glazed or triple-glazed units. Laminated glass unlike toughened glass will, when hit with force crack rather than smash into tiny pieces. For safety reasons, laminated glass is used in the windscreen of cars. Because it can be difficult to break, laminated glass can be dangerous when you do need to break it, in the event of fire for example. But its strength is an advantage if security in your conservatory and access to the main part of your home is a major consideration. Laminated glass is made by bonding two layers of ordinary annealed glass in a sandwich around a plastic sheet. Typically this would be: 3mm glass + 0.38mm plastic sheet + 3mm glass, giving a final product that would be referred to as 6.38 laminated glass. The thickness of laminated glass means that it has better insulation properties, both to cold and noise than toughened safety glass. But as it is more expensive than toughened safety glass, you will need to calculate the benefits of the extra cost compared to the security properties and insulation aspects. British Standard EN 12600 in UK Building Regulations specifies the standard for Toughened Safety Glass. In short, toughened glass has to be difficult to penetrate, and if broken, disintegrate into hundreds of small, relatively harmless pieces without sharp edges. It must also be resilient to fire. Toughened glass is usually specified in conservatory construction, it is made by heating ordinary float glass to approx. 620 degrees C so that it begins to soften and then rapidly cooled. This can only be done after the glass has been cut to the size needed for your conservatory, so you must allow time for this in the production timetable. Toughened safety glass is especially effective if it is double–glazed. The extra pane of glass strengthens the window making break-ins more difficult. Self–cleaning glass has a thin photocatalytic coating applied to the surface of the glass. The coating uses the power of the sun’s ultraviolet rays to steadily break down organic dirt using what is known as the photocatalytic effect. This loosens dirt and grime from the glass. To remove the dirt and grime, self–cleaning glass also has to have hydrophilic properties. This means that when rain flows down a pane of glass it can wash away the grime loosened by the photocatalytic process. Together, these processes allow the conservatory glass to stay cleaner for a longer period than untreated glass. Self-cleaning is a slow process that is fine for clearing small particles of dirt, but slow to remove larger areas of dirt such as bird-droppings. If you find the need to clean self-cleaning glass yourself you should take the utmost care and follow the manufacturers or installers instructions. Use soft water and don’t scrub the conservatory roof or use a abrasive cleaning product otherwise you will risk damaging the self cleaning properties permanently. Once you have cleaned the conservatory roof, it may take several days for the self cleaning properties to restore themselves and begin working automatically once again. Self–cleaning glass can be used in combination with Heat Reflective Glass if you specify it to your conservatory supplier at the design stage. Curved glass is most often found in late-Victorian and Art Deco architecture. If you own a home from this period and wish your conservatory to harmonise with it you may need to specify curved glass for some areas of the conservatory. This will be particularly important if you need to apply for Planning Permission for a Listed Building or one in a Conservation Area. Curved glass can be made in laminated glass or toughened safety glass in single as well as double–glazed units. It is also possible to have curved glass units in Heat Reflective Glass, but the tint may not be applied if you apply for Planning Permission for a period home. Curved glass is very expensive. Leaded glass, also known as Leaded Lights is a throw back to the time when all glass was hand blown and thus only available in small pieces. These pieces would then cut to a diamond or rectangular shape and joined together by lead to make a single window. Stained glass is made in the same way. Using leaded glass can help you receive Planning Permission for a conservatory being attached to Listed Building or one in a Conservation Area. Modern leaded glass is not made using the same time consuming process of joining small pieces of glass together. Instead, lead strips are inserted inside a double–glazed unit. The disadvantage of this is that the lead does not acquire a natural patina as it is not exposed to the elements and stays bright and shiny. You can overcome this problem by asking for the lead strips to be aged before being inserted into the double–glazed unit. We call this Antique Lead. If you own a Georgian period property, it will probably have windows made up from Georgian Bars. Georgian windows are most typically made up of a number of panes. It is possible to make Georgian Bar double–glazed windows for a conservatory but these will be more expensive than single panes of glass due to extra time and materials needed to make them. A Bar inserted between the panes of the glass double glazed unit. This is the least costly and used mainly in PVC conservatories. Astragal bars – where an imitation georgian bar is adhered to the glass either side of the double glazed unit and a further imitation spacer bar is inserted between the glass, so that the effect is of individual panes. This method is particularly useful when requiring narrow Georgian bars. Individually glazed panes of glass within the Georgian Bars. Because of good glazing practice, it is not practical to provide this method with bars less than 44mm wide. Frosted glass, etched glass, patterned glass, obscured glass and bathroom glass can be used on the sides of a conservatory if privacy is an issue and you are overlooked by neighbours or passing traffic. It can also be used in the roof of a conservatory if it is overlooked from upper windows. You can choose glass in a variety of patterns and tints and can be etched with a sandblaster in different finishes. You will need to place the patterned side on the inside of the conservatory so that dirt and grime can easily be removed from the flat outward facing side. 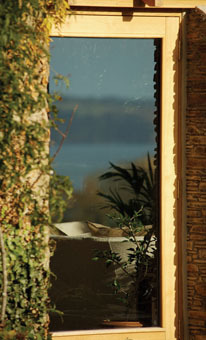 In double–glazed units both the inside and outside can be flat, with the patterned side in the middle of the sandwich.